You are here: Home / Self Help / General / You, A Dragon Slayer? You Bet! After our electricity came back and “normal” started creeping back onto the scene, I couldn’t help but notice what a mess the house had become. I normally have things straight and pretty – with flowers sitting here, potpourri baskets placed there, candles here and there, and plenty of pillows and throws for good comfy measure. As I looked around, though, it seemed like the ice storm had reached inside the windows, somehow, and purposely cluttered everything within reach. The reason was obvious: I hadn’t been paying attention and, well, let’s be honest, my level of care was at an all time low. We had been coming and going irregularly, making messes and leaving them before they demanded anything from us. Little messes add up, pile up, and back up, though, and it isn’t a very pretty sight. I spent all day Saturday putting our house back together. After a couple of hours, I actually recognized it again. Home! Things can come out of left field and knock us entirely off our game, can’t they? On the grandest scale I’ve ever seen, our country is still paying for the ramifications of September 11th. Fingers point and tongues wag, but let’s not lose sight of who the enemy truly was and how terribly that first blow hurt. We fought back and the fight drug on longer than anyone hoped for. War’s ugly. War’s costly. We’re still paying. As more and more businesses close their doors, people aren’t panicking as much as they’re just feeling very, very sad and possibly very, very defeated – as though we’re caught up in something that can’t be made right ever again. Personally, I think it can be and I believe it will be. I believe that God gave our country the perfect leader for these times. President Obama’s critics always pointed to his inexperience and “greenness” as reasons for not supporting him. These so-called negatives will, I believe, prove to be huge positives. He hasn’t been tainted by old school politics that seem incapable of fresh solutions or innovative policies. He brings enthusiasm, excitement, and hope to a country that needs as much of each as she can get. My Saturday of whipping this house back into shape does not compare whatsoever with the task in front of our new president (not even the laundry room), but he seems to have the same attitude I had when my task began. I knew, of course, that after a few hours everything would be back to normal. There wasn’t any doubt. And I don’t see any doubt on his face or hear any doubt in his voice. His “Saturday” is underway and I believe the results will amaze us all. So the next time you see a restaurant go out of business or a store close, try very hard not to get discouraged. Keep your chin up and keep supporting the businesses in your community. The weak will struggle in this economy – they’ll either grow stronger out of necessity or they won’t make it. The same philosophy actually carries over into every aspect of our lives. If we want better, we have to become better. If we want to be stronger, we have to become stronger. We won’t do that by sitting on our hands, hoping that someone else will do it for us. We have to be the heroes and heroines of our own lives. If you battle with your weight, stop “planning” on doing something about it and start doing something about it. Being overweight is limiting, unhealthy, and can lead to a shorter life. Move that body and keep it moving! If you’re struggling with an addiction ask yourself if you want it to keep driving you everywhere it wants to go, when it wants to go or if you want to get back in the driver’s seat. You’ll never enjoy complete freedom while you’re in shackles. If any of your relationships are less than what they should be, stop focusing what they should be doing and do things differently, yourself. To a large degree, we train people how to treat us. If we’re sarcastic, negative, and overly critical, we train people to avoid us like a foul smell. If we’re weak little throw rugs, we train them to feel perfectly free to wipe their feet on us whenever they so desire. God knows I hope you’re neither of those extremes, but you get what I’m trying to say. Look within, not without. If you wish Mr. X were more attentive, be more attentive to him. If you wish your children talked to you more, listen to them more (really listen – don’t do ALL the talking or ANY of the nagging). If you wish Mrs. X wouldn’t nag, make a concentrated effort to give her less reasons to do so. If your finances are strapped, your health is poor, or you’re feeling completely discouraged – do something about it. Don’t remain in the quicksand, walking in circles. Find someone who can help you climb out of the quicksand and step into a better life. 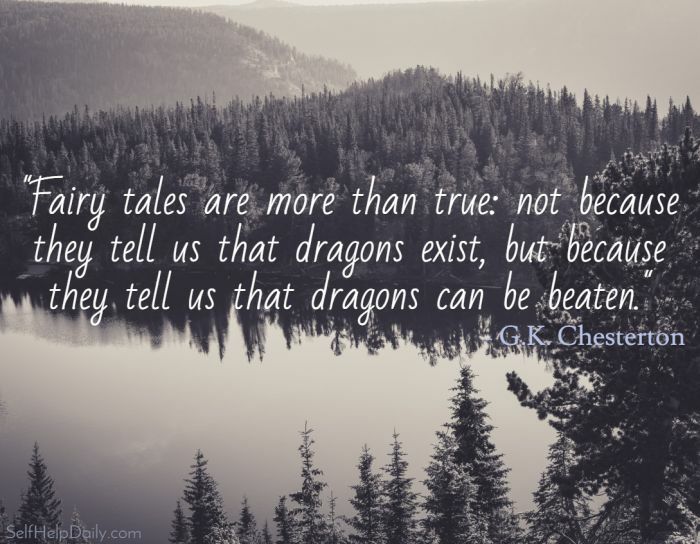 As the wonderful quote at the top of the post says, dragons can be beaten. So no matter how your own personal dragon masquerades itself (as a weakness, a bad habit, an addiction…) – you can defeat him because you’re stronger. You just have to believe it. So SHOW UP, SUIT UP, and STEP UP. That dragon won’t know what hit him. We may have more than we think and need to remind ourselves about them. Like family, friends, health, job, home, nature, pets, music, faith . . .
You are so right. Any time I’m under the weather (with anything from a cold to bronchitis) I always think how I take health for granted. Unfortunately, not long after I’m well, I’m right back to taking it for granted again. Beautiful quote, too, by the way. Fresh air is one of the most beautiful things in the world!